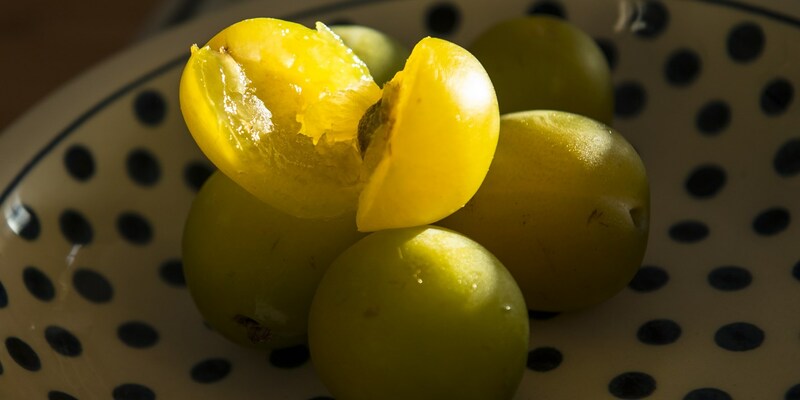 Greengages are a type of pale green plum with sweet, juicy, golden flesh. They are fairly high in pectin and are therefore fantastic for jams and jellies. Always try to use under ripe fruit as it contains more pectin than the riper plums and is slightly less sweet which is good when using large quantities of sugar as in jam making. If you don’t have a sugar thermometer to test the set, place a small plate in the fridge for 15 minutes then put a small amount of jam on to the cold plate. If a skin forms, the jam is ready to take off the heat. If not, keep boiling and repeat the process. To add a little bit of luxury to your greengage jam, scrape the seeds of a vanilla pod in whilst cooking. Fruity white wines such as Viognier and Gewürztraminer make an interesting, zingy substitution for the water. Plums go well with other stone fruits like peach, nectarine and apricot so if you have an abundance of these then try mixing them together. Greengage jam goes brilliantly with cheese, especially Gruyère, spread on crusty white bread for an afternoon treat or serve with crackers for an after dinner cheeseboard. Gooseberry jam is also great to use in baking, try using it instead of raspberry in a bakewell tart, smothered on a scone or piped inside a doughnut.